5 Insights from 5 Years in Business: Happy Birthday ConverSketch! ConverSketch turns 5 tomorrow! I enjoyed reflecting last year on my top 4 Wisdom Nuggets from 4 Years, so this year it’s baaaaaaack as 5 Insights from 5 Years in Business. 2. Focus on what you want…Be very clear with yourself on this one, because I know from experience what I focus on is what I attract to myself. There is no right answer here. Some people want to work hard, hustle and build an enterprise. Some want a small business they can run from anywhere. Some people want the flexibility to work at 2 am when a stroke of brilliance strikes and not have to show up at 8 am. Whatever it is, be clear with yourself and others. 3. …then actually DO it. Often it doesn’t take much time to get a significant amount done on a project. Research shows that checking email compulsively can actually have a negative impact on your IQ and creativity. I personally have found that not checking email first thing, and instead setting aside some morning time to do something creative, even if it’s only for 15 minutes, helps set the tone for the rest of the day. Dedicating a chunk of time to focus solely on one project without distractions, then giving yourself a mental break can help you get heaps done before noon! More on this and a tool I’m testing to help you in the next email (insert mental image of me rubbing hands together with anticipation). 4. Be authentic. As a graphic facilitator, it can be easy to slip into an overly formal relationship with clients. I’ve found that being myself, cracking jokes while also honoring the vulnerability and dignity of the people I’m guiding through a process helps them be more real with each other and get more real work done. Please remember…YOU are a GIFT to this world. Nobody else can do the things you do the way you do them. 5. Maintain an attitude of gratitude. I think this is foundational to the success of anything a person does. When I’m rooted in a space of appreciation, I find that’s when the Flow happens – creativity, business, generosity from others…The most beautiful thing is, there is no limit to the amount of gratitude you can feel and share! I’m so grateful for each of you. I love reading your emails and reflections, answering other questions and sharing resources. Without you, my fabulous clients and conspirators, ConverSketch wouldn’t be much of anything! Click on the image to see the larger version. Ready for an authentic, trusting, action-oriented, gratitude-filled session of graphic recording?! After Kenya, 2017 has been off to a rockin' start. 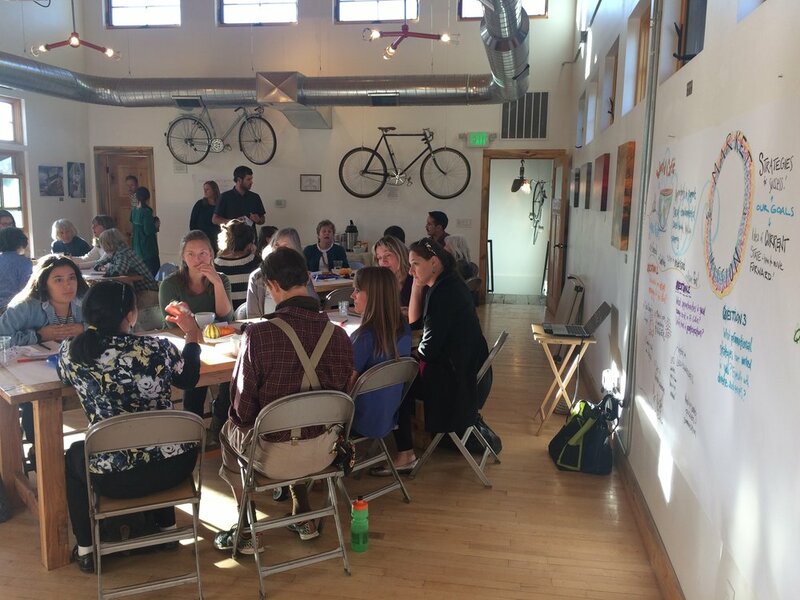 I've had the pleasure of creating and implementing graphic facilitation processes for clients and taught a two-day intensive facilitation course for graduate students in natural resources here in Fort Collins. I'm also at varying stages of video production for the CSU Alumni Association, the National Park Service Climate Change Response Program, the WiRe wildfire research team and others. Next stop: San Diego! Hello and Happy Holidays friends! I hope so far yours have been filled with laughter, light, and lots of merriment. It’s wild to think that this will be the last email to you all in 2016. Last year at this time I wrote about the power of having a clear vision for the next year(s), and how I like to create a Vision Board each New Year. I’ll definitely be taking some time to be intentional, plan and set goals for 2017. One thing we may not take enough time to do for ourselves is to look back and appreciate what we’ve accomplished. Making time to think about what I’ve done helps keep me energized. In the day-to-day, it’s easy to be caught up in what’s next, what didn’t get done, which graphic recording or video client I need to communicate with, what deadline is around the corner. It’s all important. And so is wrapping your head around what you’ve finished, nailed, achieved, sailed beyond, and rocked. Reflection can also be a time to learn from your year – things often go differently than we plan and sitting with and open mind and reflecting on what you’d do differently helps you improve and refine your work. So go ahead, pour yourself some tea (or wine) and take some time to reflect on what you’re proud of in 2016, and visualize the year ahead. I’ve created this custom, printable template to help you get started, or feel free to create your own from scratch! Right click then select download to save and print your own! Want to create a beautiful, visual plan of action for 2017 with your team? Click the button to find out how we can work together to create a vision and strategies that you'll actually want to look at every day. As you read this, I’ll be on the first leg of a two-week trip to Samburu, Kenya. This will be my fifth time taking students from Colorado State University to a rural community where we’ll be helping Unity Women’s Village with whatever small building project they need, teaching in schools, listening to students’ stories who are attending high school through scholarships, and discussing conservation with young girls in the community. Mostly though, we’ll be learning, building relationships, and thinking about some of the world’s most intense challenges: poverty, access to health care, women’s rights, access to clean water, culture and technology, equality…the list goes on. We will have irregular internet access so thanks in advance for your patience until January 13. To keep friends and families in the loop, the students be posting stories and photos to this blog most days. Happy New Year! It's time for some experimenting here at ConverSketch. So this week I'm keeping it short and sweet with few words and mostly images of what I'm working on. Last week I worked to graphic record and co-facilitate a workshop with researchers and practitioners that help ensure disaster recovery work includes and is sensitive to the culture of the people affected. I've also been working on a heap of videos this fall -- here's a snapshot of me painting some veggies for a restaurant in downtown New York City that is seeking to triple the impact of every dollar through its business model, and a screenshot of a video for the National Park Service on smart wildlife watching (click to see it!). Other videos in the works include research on bovine tuberculosis, fish consumption advisories, climate change in National Historic Parks, and fire mitigation strategies for homeowners. 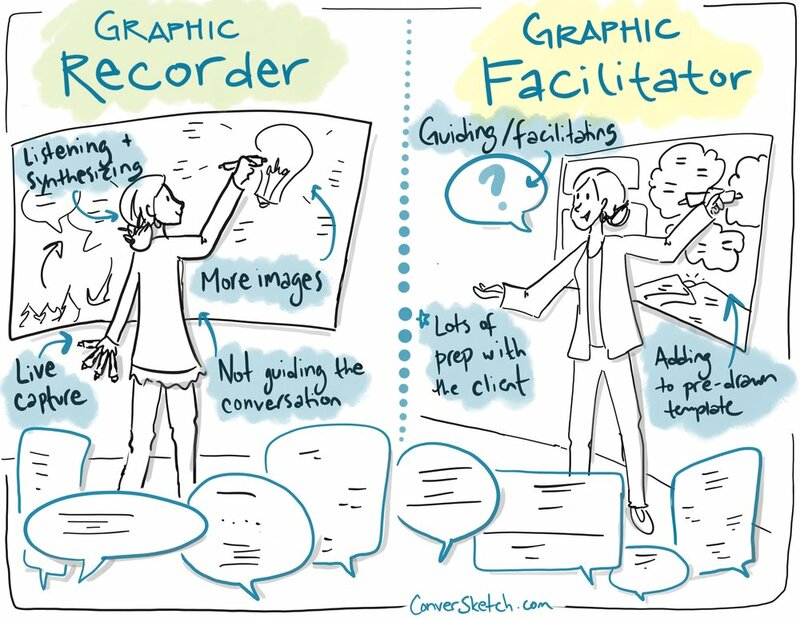 Finally, I've been working with the Conservation Leadership Through Learning Master's program at Colorado State University to do a short training series on basic facilitation and graphic recording skills for conservation professionals. Here they are facilitating a World Cafe. I need your help! Did you like this shorter email? Not so much? Please let me know so I can send you Email Goodies that spark creativity and are full of interesting little nuggets to make your day better.